Extremists driven out of Iraq’s the Nineveh Plains “riddled the region with land mines” and “put bombs in children’s toys” according to a senior Catholic cleric. 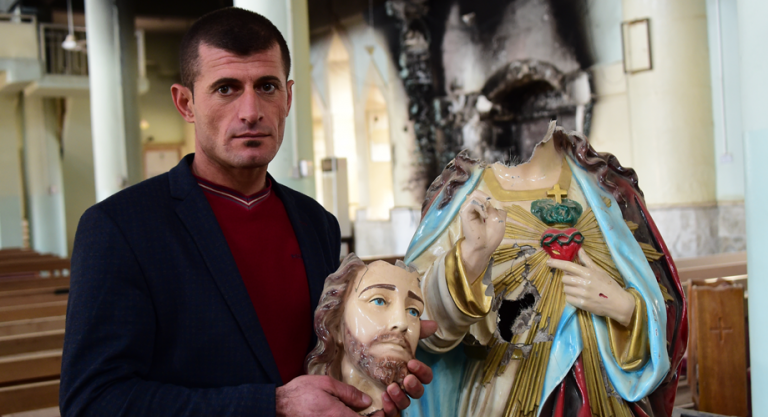 Fr Luis Montes, Latin Episcopal Vicar for Kurdistan, told Catholic charity Aid to the Church in Need: “Approximately 60 percent of the homes on the Nineveh Plains were burned down. He said that members of Daesh (ISIS) had also “put bombs in with children’s toys” that would have exploded when people returned to their homes. He said: “The mines first need to be cleared out of the entire region. Only then can the villages be restored, and [then] from the ground up. Everything still needs to be done, the people have nothing left. ACN’s project partner, Fr Montes added: “When we received the news that Daesh was retreating, a spontaneous celebration broke out in the refugee camps. Despite the challenges, Fr Montes said the Iraqi Christians lived “not only in peace, but also with joy. The priest asked for continued support this winter, stating that the pressing need for refugees in Erbil is for “blankets and more blankets” as the average temperature is -3°C. The charity continues to respond to urgent requests for aid from the Church in Iraq.